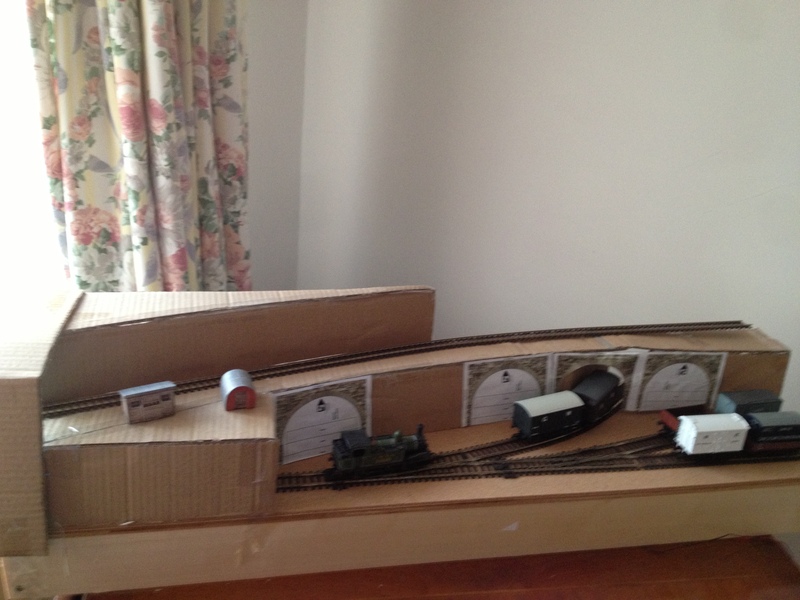 The bottom level track is in place and I’ve nearly got an operational railway in 300 square inches! 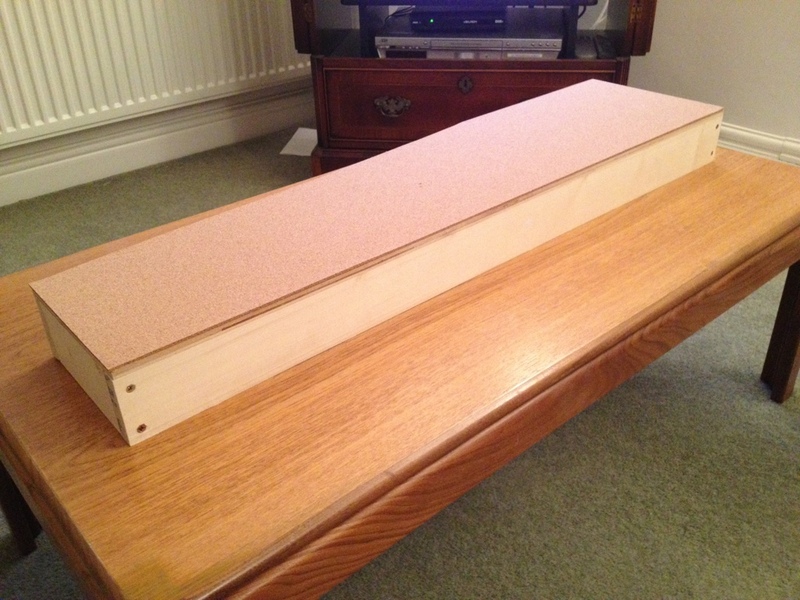 Making the most of the restricted space is the biggest challenge, and a key part of the design is having the front track as close to the baseboard edge as possible. 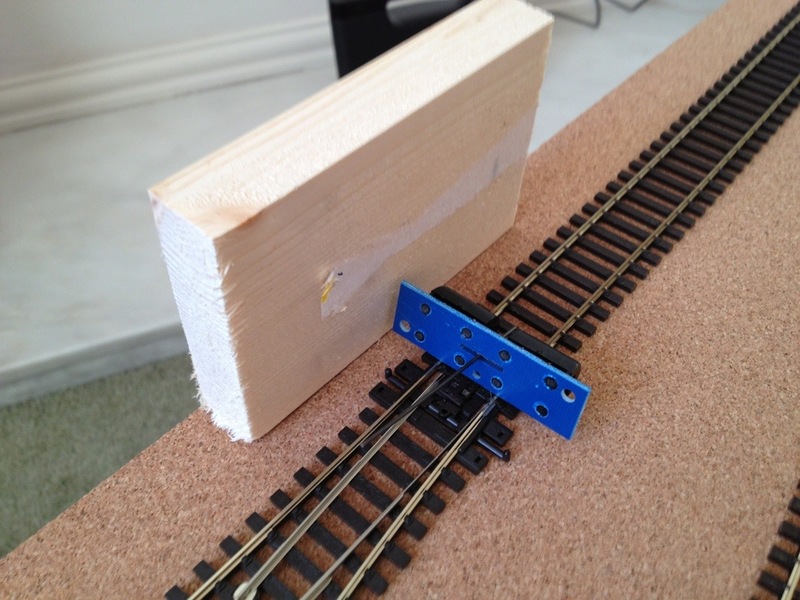 Using an off cut of baseboard frame I positioned the turnouts so that there was sufficient clearance to squeeze in the SEEP point motors, and established the minimum gap between the edge of the sleepers and the edge of the board. 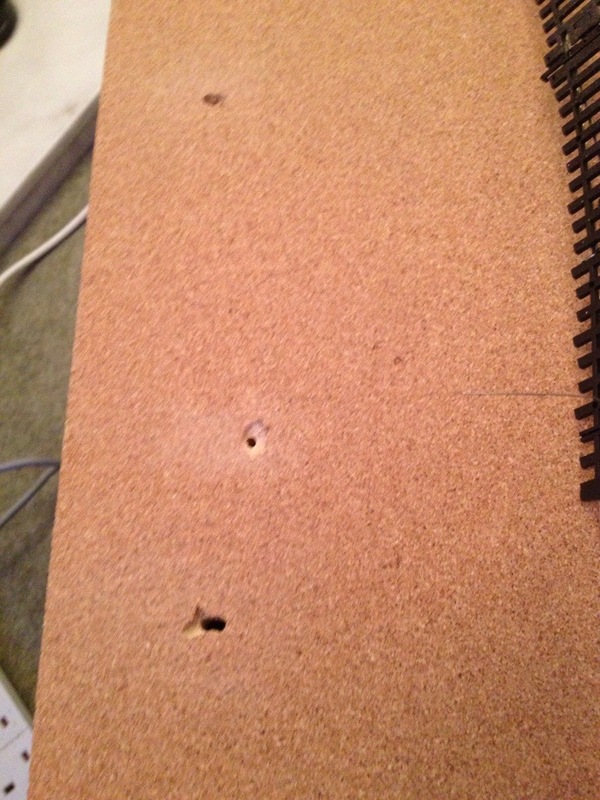 The board was then marked along its entire length using a straight edge to show the alignment of the front track. Next step was to finalise the exact position of the turnouts such that the sidings could accommodate the wagons needed to operate the shunting puzzle with sufficient clearance before the sidings converge. 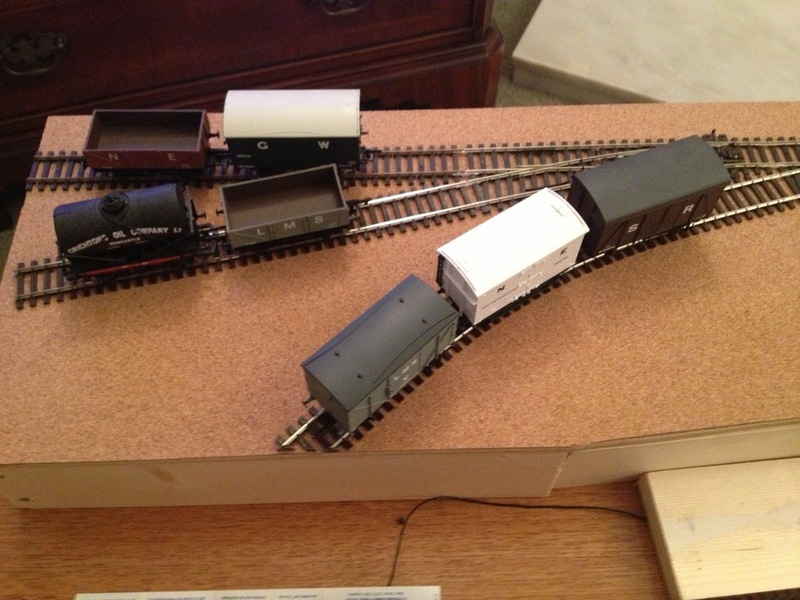 I connected the rearmost turnout to a length of flexitrack that was going to become the headshunt, then using an engine and wagons determined the minimum length this could be without anything fouling the turnout blades. 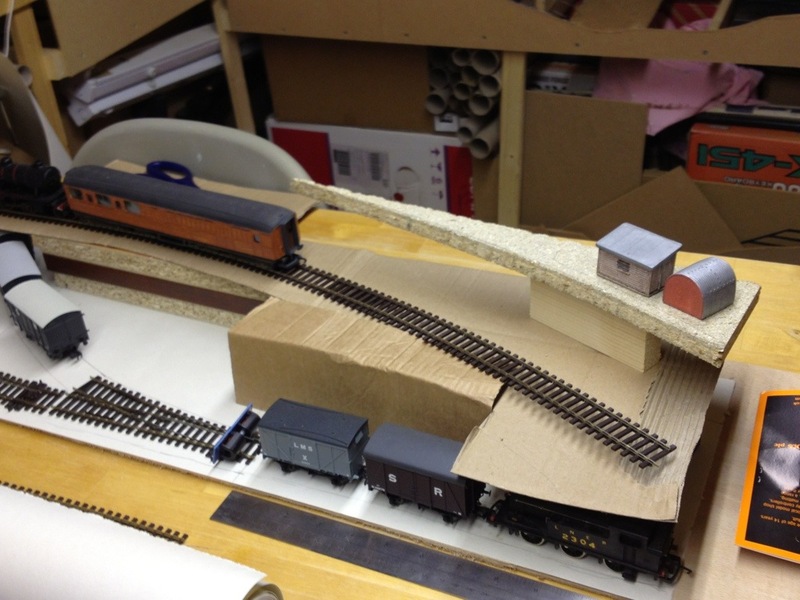 This way I can get maximum space for the sidings so that they don’t need to go right to the edge of the board and leave room for an interesting scenic development at the widest end of the board. With final position established I marked the position of the turnout tie bars and power feed to the frogs on the board surface. Slots are drilled to allow the SEEP motors to switch the turnouts from the underside of the board and holes drilled to take the frog wires. 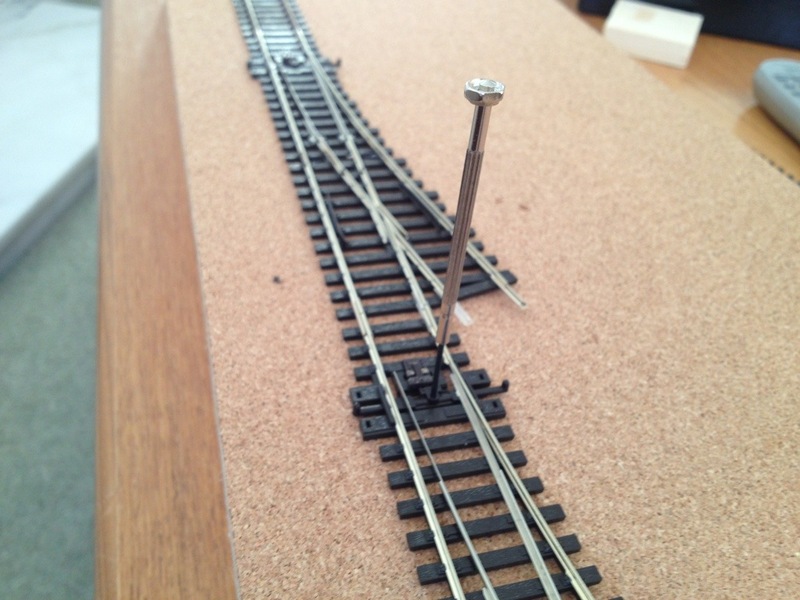 Using a straight edge against the sleepers to keep the flexitrack properly aligned the front track is nailed in place. 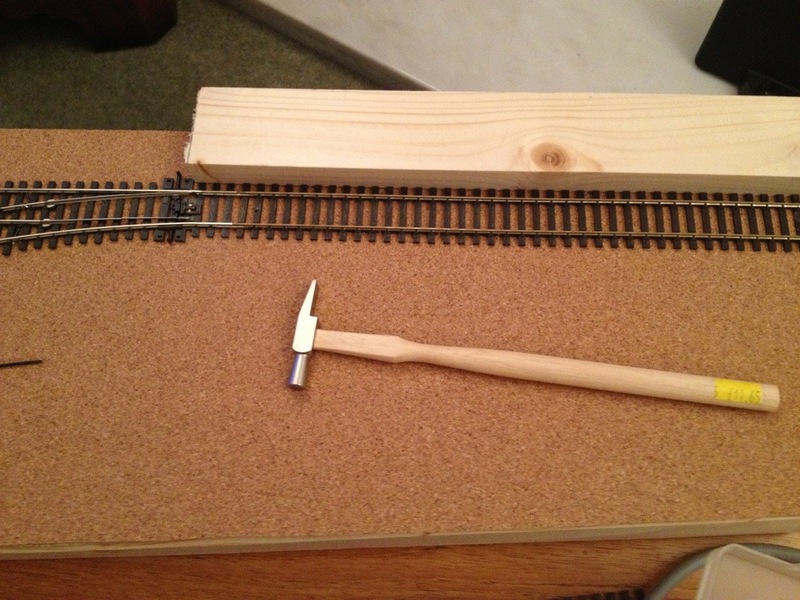 I find a very small hammer is best to tap home the track pins after drilling holes in the sleepers using a 1mm drill bit in the Dremel. The Dremel is also my favourite tool for cutting track, as it gives a nice clean cut. My efforts with a hacksaw usually result in too many damaged sleepers and chairs that no longer hold the rails properly. 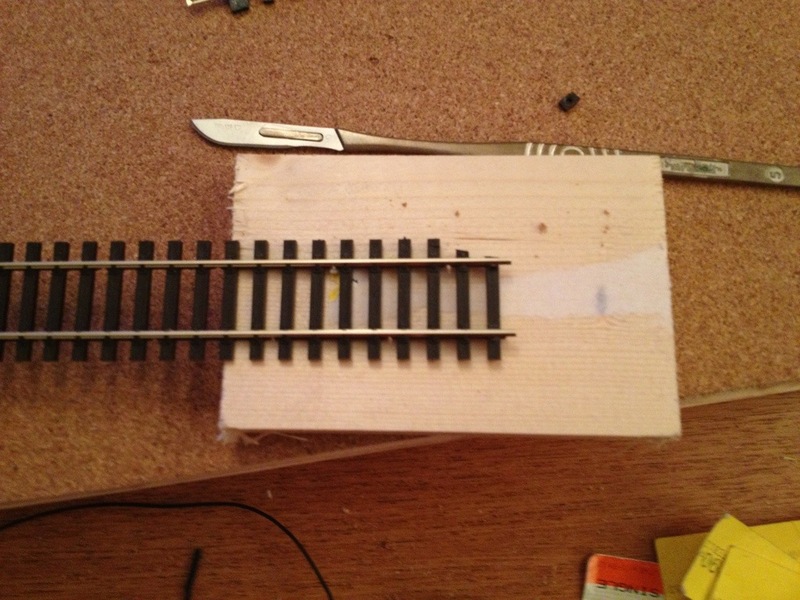 A sharp knife is needed to trim the sleepers of the flexitrack leaving the turnouts to ensure a snug fit. It’s also necessary to cut away the chairs holding the rails on the final sleeper so that the fishplates will fit snugly on the rails and the track stays flat for smooth running. 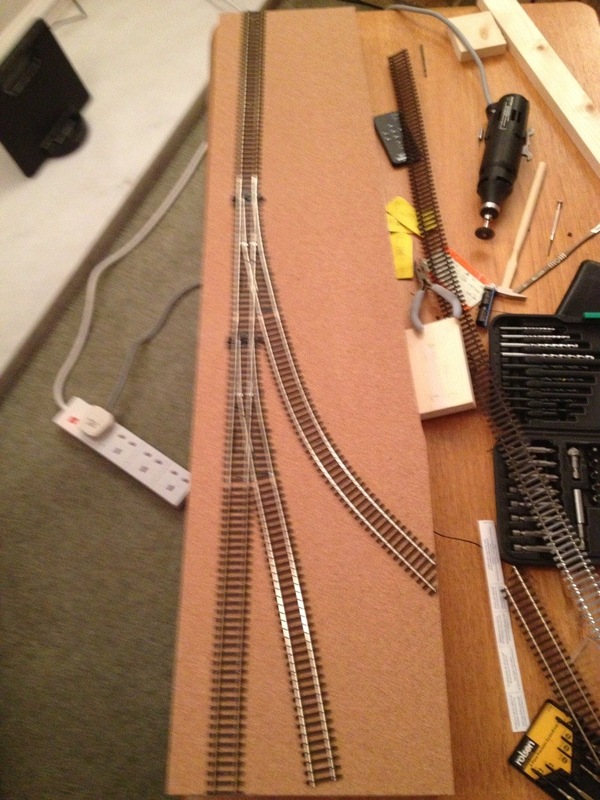 With all track cut to size and pinned in place the bottom layer is beginning to take shape. At the moment I’ve left the end of the middle track loose as I’m not certain of its exact alignment. It may need to disappear into a warehouse door along with the siding next to it, but as yet I haven’t made a final decision. So, next step is to wire it up and make it work.